The DD SuperLight - A-Frame Tent is designed to be used on top of the DD Superlight - A-Frame Mesh Tent (sold separately) to create a 2-layer set-up with 3 separate entrances. 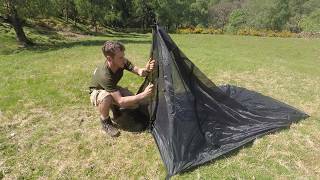 The DD SuperLight - A-Frame Tent is a great solution when travelling, or for minimalist backpacking. Designed to be supported at either end using hiking poles, this tent fits into one small bag - and at just 730g (excluding pegs/guys) it won't weigh you down! Spacious enough for 2 people plus rucksacks, the DD SuperLight A-Frame Tent has a 3,000mm PU coating and 3 doors, the larger of which can be raised to form an entrance canopy - so it'll keep you dry in stormy weather while its air vents prevent condensation inside. The DD SuperLight A-Frame Tent can be used either on its own as a day shelter, or in conjunction with the A-FRAME MESH TENT for backpacking adventures.